A home is among the biggest investments you’ll ever make. So when you choose someone to install or repair the biggest protector of that investment—a roof—extreme care is advised. At Ridgeview Roofing Company, LLC we strive for perfection so that you can be satisfied every time. We operate on the principle that the quality of who we are and how we work with you are equal in importance to the caliber of what we create. Integrity is the core of every action we take to help achieve an owner's objective. We've built a successful company that helps people stay in their neighborhood. Our goal is to do the best job for our customers, give them quality and serve at a competitive price to keep calling us! We have established a complete team of quality and professional roofing contractors in Bergen County NJ allowing us to be minimally disruptive, timely, and still achieve the quality that you expect. We also believe that by hiring the best people for the job, you get better quality work done on time. 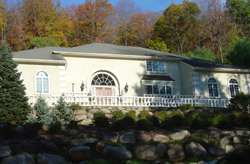 We provide roofing services and installation in Bergen County NJ. Call us today to speak with one of our roofing contractors and experience the best in roofing and gutter services. You’ll be glad you did! Ridgeview Roofing Co. LLC, (201) 236-8332, fax: (201) 236-8332 *51, info@ridgeviewroofing.com | Base Content Copyright © 2019 Market Hardware, Inc.